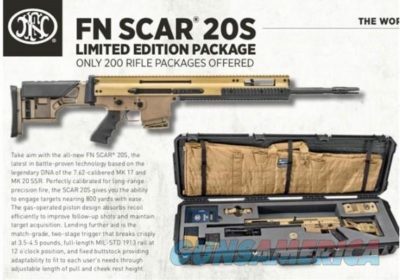 FN America is releasing a commercial variant of their Mk 20 called the FN SCAR 20S. Originally developed for military use, the 20S is a precision rifle with a 1 MOA accuracy guarantee at 100 yards with premium ammo. Like the Mk 20 SSR – Sniper Support Rifle – which is in use with the U.S. SOCOM today, the 20S is chambered for 7.62x51mm NATO. It was purpose-built for accuracy at longer ranges, without sacrificing any of the reliability of its short-stroke piston system. The Mk 20S has an extended 20-inch-long barrel and elongated handguard. The barrel has a 1-in-12 twist. The rifle achieves much of its accuracy thanks to its heavy-profile barrel, barrel extension and monolithic receiver. The extended receiver allows for more flexibility with optics and enables users to add forward-mounted accessories in front of the scope without modification. One of the biggest differences between the SCAR 20S and the other SCAR rifles is the new style of stock. The new stock is more appropriate for a precision rifle and can be adjusted for length of pull and comb height. Also, every Mk 20S comes with a Geissele Super SCAR trigger factory-installed. The match trigger has a 3.5-4.5-pound trigger pull. The guns are shipping with 10-round magazines but are of course compatible with 20-round SCAR mags. Flat dark earth is the color option for now. If you feel like you have a SCAR 20S hole in your heart don’t wait because these will completely sell out, and sooner than you think. FN is also releasing a limited edition of 200 “Sealed in the Factory” collector’s rifles. The collector’s rifles come in a custom SKB hard carry case that includes FirstSPear R37 Rifle Wrap Soft Case and shooting mat, an FN SCAR 20S Field Kit with cleaning supplies and SCAR tools, a limited-edition patch, a limited-edition coin and a coupon for a free copy of the ARS Mechanica Ultimate FN Book, in addition to the rifle. The rifle also comes with one 10-round and one 20-round magazine and Harris bipod. If you’re interested in either of these get ready for a little sticker shock. The standard 20S runs around $4,499 while the limited edition is a cool $6,999. Even at these prices FN will have less trouble selling ’em than buyers will have finding ’em, so act fast! seems like a great rifle. ive owned 3 17s, and they are awesome rifles. These 20s have the heavier barrel and receiver, which should allow sustained fire with more accuracy. The biggest flaw is the caliber. if this comes out in 6.5 creedmoor, ill def purchase one. Only 7 grand, hell send me a case of em! .762×51, really????????? . That is a serious blunder. Fine for military, but there are better calibers available. How about any of the 6.5mm caliber, (Creed, 6.5×47 lapua etc) , or .338 Lapua. A nato 7.62×51 round is slower than a 6.5 Grendel after 500 yards! I guess it is what it is. Way way way waaay over priced . Even the scar 17 heavy is to much for what you get. It’s like your paying a premium for a name, and because special forces use them and you see them on video games lol. My brother has one, I’ve shot it and although it is nice, it isn’t anything special either. Ho-hum. I have gotten sub MOA groupings with everyday 7.62 at 100 meters with my SCAR17 and it cost a lot less. Same here. My SCAR 17 is extremely accurate with just plain old bulk .308 ammo. Awesome rifle!! It all sounds very nice — but do these rifles kiss you on the lips? I just put a 6.5 Creedmoor upper on my elderly AR-10 … no other mods needed and I guarantee this $600 upgrade will out-shoot these multi-thousand dollar FNs … I have to wonder what the point of creating this very nice rifle in an old-tech caliber is … But, even as I castigate this rifle, I continue to love my FNAR … just wish there could be a way to upgrade from .308 to 6.5 Creedmoor.